214 pages | 6 B/W Illus. This volume explores a dimension of authorship not given its due in the critical discourse to this point—authorship contested. Much of the existing critical literature begins with a text and the proposition that the text has an author. The debates move from here to questions about who the author is, whether or not the author’s identity is even relevant, and what relationship she or he does and does not have to the text. The authors contributing to this collection, however, ask about circumstances surrounding efforts to prevent authors from even being allowed to have these questions asked of them, from even being identified as authors. They ask about the political, cultural, economic and social circumstances that motivate a prospective audience to resist an author’s efforts to have a text published, read, and discussed. Particularly noteworthy is the range of everyday rhetorical situations in which contesting authorship occurs—from the production of a corporate document to the publication of fan fiction. 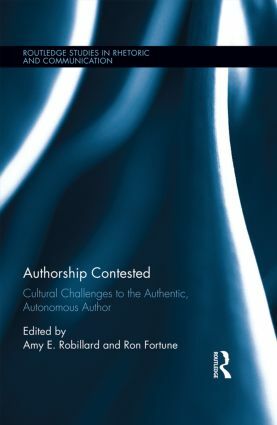 Each chapter also focuses on particular instances in which authorship has been contested, demonstrating how theories about various forms of contested authorship play out in a range of events, from the complex issues surrounding peer review to authorship in the age of intelligent machines.